Happy New Year! I look forward to all the fun we are going to have at Keep It Thimble this year. Last year, I posted my 2011 Goals for KIT and accomplished about 25% of them. So instead of writing up another list of goals for 2012, I will actually do them, and you’ll just have to be surprised! Here are the results of the poll I conducted just before the holidays. Thanks to everyone who participated. This information will be used to make Keep It Thimble a more useful resource for you. I was surprised that Flea Market Finds was so popular! That’s good information to know and you can be sure there will be more finds posted in the future. Finally, here’s a fun new project to start for the new year – building houses from scraps. 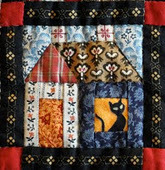 Jeanneke is a quilter from the Netherlands who has organized a virtual quilting group. The goals is to create one 4 1/2″ x 4 1/2″ house block each day. The fun part is that you will use your scraps! Thus, the name of group is “Building Houses from Scraps“. Check out the link for more information on how to participate. It is free to join, and has been so popular that she has extended “official” registration until Jan 16th. I don’t know if I can make 365 of these blocks this year, but it sure will be fun to try. Building Houses from Scraps really looks like a fun idea. 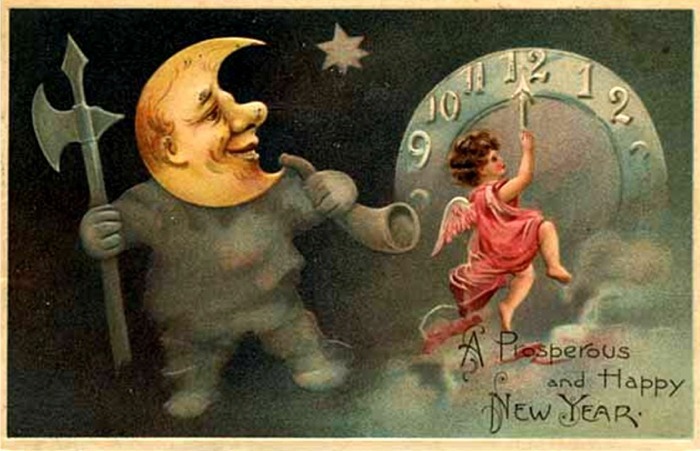 Love your New Years Card. If I only make 1 house does that count??? ?